Water vapor in the atmosphere is the first greenhouse gas. In the stratosphere, its impact on the radiative balance, on the key mechanisms in ozone chemistry and on aerosol formation is very important. Due to its experience with the ELHYSA instrument, the LPC2E develops a new frost point hygrometer for the study of the stratosphere that can be embedded on dilatable light balloons or be used as a secondary payload on BSOs (Open Stratospheric Balloons). The light balloons allow a great ease of launching. Thus it becomes easy to make temporal follow-ups or geographical analyzes. In addition to the lightness of this instrument, the manufacturing cost will have to be very low (≤5k €) to be compatible with the risk of loss of instruments under light balloons. The principle of measurement by frost point (or dew point) is the reference method in the case of the study of the stratosphere because it is well adapted to low concentrations and has a great dynamic measurement. Such a development requires a test bench or a calibration bench of this prototype which was our first work and which began in late 2014. This bench is mainly composed of a chamber containing the instrument and a humid air saturator. The whole works in a closed circuit. In the saturator, the temperature is much lower than that of the rest of the circuit. It is controlled by Peltier modules. The air saturates in contact with ice-covered surfaces (frost point temperature). Then the air coming out is warmed to the temperature of the measuring chamber before entering it. The circulation of air in this circuit is done by a fan. It will be possible to test the hygrometer at different temperatures (from about -20 ° C to -60 ° C) while allowing the choice of the humidity rate of the air (frost temperature of about -30 ° C to -80 ° C). The air circuit of the bench is connected to a pump allowing to choose the pressure to simulate the altitude at which this test is made. With this bench we will be able to simulate the conditions of the stratosphere (humidity, temperature and pressure) for our instrument. Previous LPC2E hygrometers measure frost point with high precision using a small mirror cooled by a cryogenic system with liquid nitrogen. 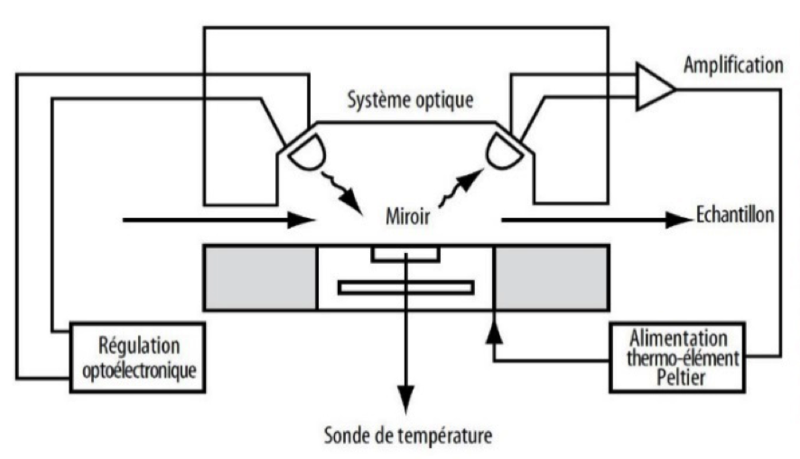 This mirror is temperature controlled and the detection of frost on its surface is done with a light source and an optical detector. Measuring the temperature of the frost point gives the relative humidity with the knowing of the air temperature. 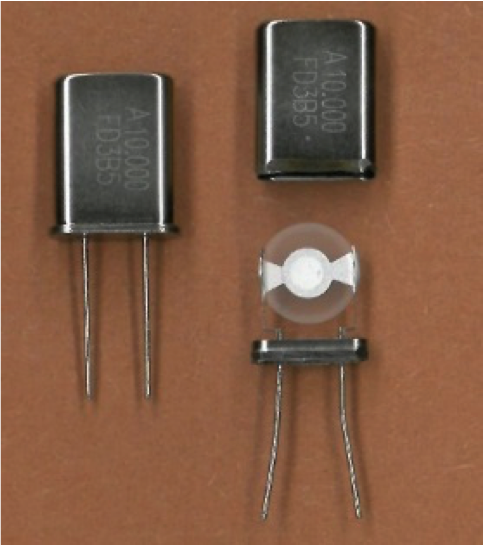 A high miniaturization is obtained by replacing the mirror with a piezoelectric element: a quartz. It will be temperature controlled by a thermoelectric cooler. As in the case of quartz microbalances we will use this quartz to measure a mass: here, the water that settles there. Quartz or quartz plate has its resonance frequency modified by the presence of a very small mass on its surface. Frequency measurement tells us how much ice is deposited. There is no light source and no optical detector. To ensure a high accuracy of the temperature measurement, we use 3 quartz (Q1, Q2, Q3). The quartz plate is very thin and it is not a good thermal conductor. It is not possible to fix it all over its surface on a thermal conductive support, because it is no longer possible to oscillate it. It is therefore difficult to know the frost temperature at its surface precisely. To measure this we use another quartz (Q2) mounted identically to Q1 and having at its center a microprobe of temperature. It will not oscillate. Moreover, the oscillation frequency variations of quartz Q1 are of course dependent on the amount of ice but also to a much lesser extent on the temperature. To correct this last dependence we will use a last quartz Q3 in its encapsulation. The oscillation of this latter will provide a reference frequency to determine frequency variations solely due to frost. This measuring head will be placed outside the instrument. The measurements are done during the ascent of the balloon. Thus, it is the relative wind that will supply air to this measuring head, there is no need for a pump. Among the criteria of performance of hygrometers we have the frequency of the measurements which depends here first on the limit of detection of mass. Indeed, stratospheric air is poor in humidity and has low density, it provides little variation in mass on quartz. It is therefore necessary to wait for this variation to reach the sensitivity threshold of the instrument. This problem is found with the mirror hygrometers. However, the quartz microbalance technique allows the measurement of a deposit in a very thin layer: not visible to the naked eye. This sensitivity should make it possible to have a vertical resolution (a frequency of the measurements) superior to the technique with mirror. This actual frequency of the measurements is therefore very dependent on the environment: pressure, humidity. The accuracy of the frost point measurement should be 0.4 °C which results in a measurement error in volume of about +/- 1 ppmv at 20 km.